In the Deep South, where sushi is just called bait, we spend lots of time grooming both our temperaments as well as our fine and gentlemanly appearances. Some of us retire to kindly cottages and others to grand manors, especially those wealthy enough that we need to buy a new boat when the first gets wet! But, no matter our occupations, we all love to make, eat, and share our delicious southern cuisine! You know exactly what we’re talking about. 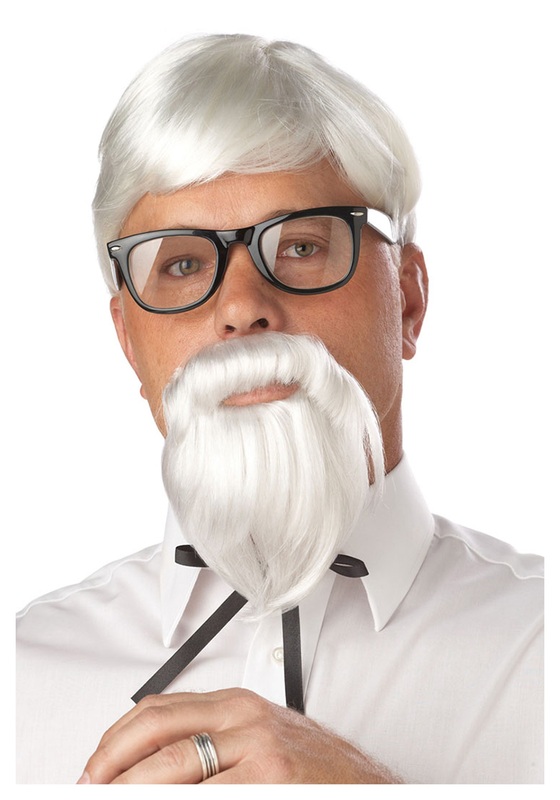 You can not only enjoy the food so much you’ll need to lick it straight off your fingers but can look the part, too, with this White Colonel Wig and Moustache. The iconic look of the southern gentleman can be yours with this white haired wig of synthetic fibers and matching (and flawlessly groomed) goatee. Both are trimmed in a debonair flair and will raise the quality of any costume at a price less than a bucket of chicken.